1 National Highway Traffic Safety Administration (2002). 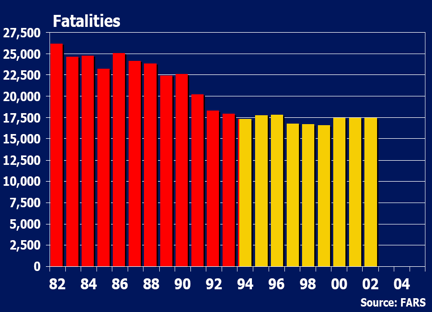 Traffic safety facts 2001: A complication of motor vehicle crash data from the Fatality Analysis Reporting System and the General Estimates System (DOT HS 809 484). Washington, DC: U.S. Department of Transportation. 5 Kindelberger, J. (2005). Calculating lives saved due to minimum drinking age law. Research Note, March, 1-4. 6 Glassbrenner, D. (2005). Safety Belt Use in 2005 – Use Rates in the States and Territories. NHTSA Research Note. 8 Levitt, S.D. & Porter, J. (2001). How Dangerous are Drinking Drivers? Journal of Political Economy, 109(6), 1198-1237. Washington DC: U.S. Department of Transportation, National Highway Traffic Safety Administration.